Part four concludes Zane Lowe’s exclusive interview with rapper Eminem. The Detroit native opens up about singing on tracks, the economic hardships the city of Detroit continues to endure and much more. Mathers explains how he enjoys embodying the underdog mentality of his city and that his music will always reflect his hometown’s fighting spirit. In fact, Marshall reveals to Lowe that he still regularly takes rides through old city neighborhoods to clear his mind and reflect on how far he’s come as an artist. Touring and live performances also served as the topic of discussion. 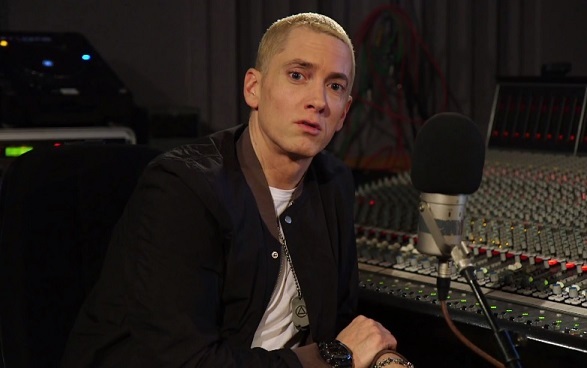 Eminem gives viewers insight into how he began performing small shows to get back into the swing of things after releasing Relapse. This entry was posted in In The Studio, Interview, Video and tagged BBC, eminem, four, hip hop, Interview, MMLP2, part 4, Radio 1, rap, slim shady, zane lowe. Bookmark the permalink.